Looking for a more effective way to navigate change? Seeing your ideas on paper can help you focus on the whole picture, understand relationships and improve your decision-making. Graphic recording is a dynamic and participatory process that captures discussions in real time, usually on large sheets of paper, using a combination of images and words. Everyone present can immediately see how their contribution fits into the whole picture. Who can benefit from graphic recording? What can graphic recording help you do? 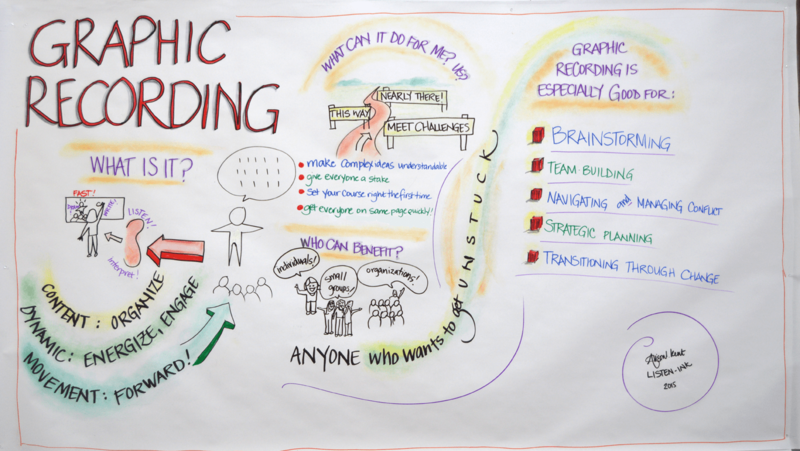 What does graphic recording do best?